Old-fashioned roller shades were commonly used in Arts & Crafts period interiors. They were an inexpensive way to provide privacy and shade. The shades were kept down when the room was not in use to protect wood and textiles from the sun and to keep the room cooler in summer and warmer in winter. This energy-saving aspect of window treatments is often forgotten, but if you like the look of uncluttered windows and still need some shade from time to time, using discrete, inside-mounted roller shades are an excellent choice. If you have very strong sunlight coming through an unshaded west or south-facing window, shades can protect curtains, provide additional shade for sleeping and add to window insulation. An attractive and practical product in the spirit of the Arts & Crafts movement. Most shades are mounted within the window frame like this Classic Cotton - Ecru shade with our Blue Tree stencil. This style of mounting is called inside mount. This custom roller shade is a back roll that provides a close seal to the window. This linen cotton shade has a scalloped edge with matching gimp. The Iris border is in red and loden. It is front roll for a finished look. The Classic Cotton - Ecru roller shade has the Large Aster stencil in red, dark red and antique gold with loden and blue. This classic old fashioned roller shade is a back roll with a pewter pull. Here is a detail of our Small Gingko Border stencil in forest and mahogany on our Classic Cotton Light Blocking - White. This is the Coffee Flower stencil on Naturals-Raw Linen. 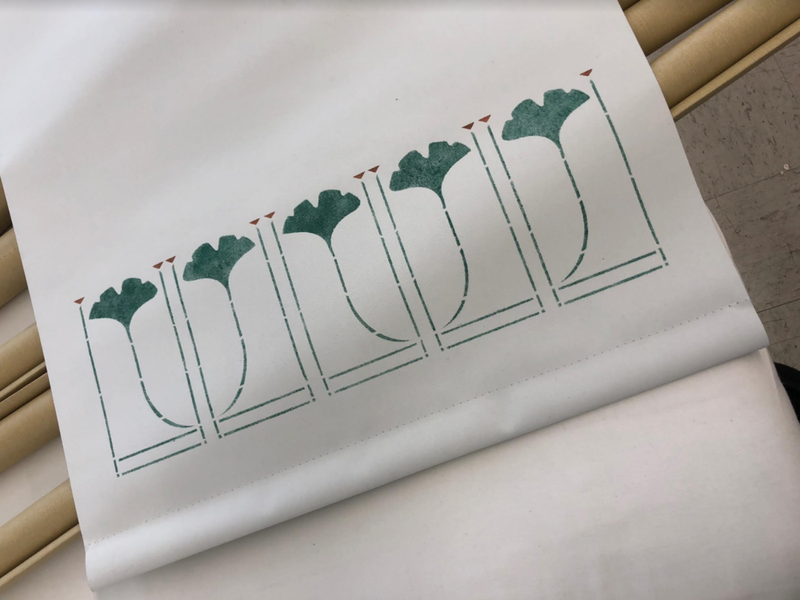 It is unusual to apply many stencils on a shade but our client plans to have this shade down most of the time, demonstrating how roller shades back in the 19th century were used to completely shade a room while providing a touch of whimsical design. Shown here is a stenciled roller shade with the Iris Border stencil, in teal and forest and a coordinated guest towel. 1. Measure the length and width of your window to within an eighth inch. Find some tips on measuring here. 2. Choose your material. We suggest ordering our fabric sample packet if you want a valance or curtains with your shades, or email us to order roller shade samples alone at no charge. Note that for roller shades only, material is included in the total cost. 3. Decide if you want a front or back roll for your shades. Traditionally, shades have a back roll to make a bit of space between the shade and any curtains. If you are using shades alone, you will probably want a front roll. If you will be adding curtains or a valance, choose a back roll. 4. Optional but the most fun: Choose a stencil ($40.00-$50.00 additional) by browsing our stencils and look at the details of the designs as well as various ways they can be used. Look at the design color card here and put together any scheme that works for your interior. 5. Traditional crochet pulls are included but you might want something special. Consider a shaped bottom edge for a vintage look for your roller shade , finished with a row of narrow fringe or gimp. 6. When looking at the price lists below, make sure to add 15” to the length of your window measurements for accurate pricing. The additional length is needed to build the roller shade. Or contact us to have us figure it out for you. Once we know which roller shades you need, we'll write up an estimate for you to review. Confirm your order with a 50% deposit and you'll have shades in about four to six weeks. At any point in the process, feel free to call us. We’re here to help and we love hearing about your home! We've have cotton and linen fabrics specially made for roller shades. We encourage you to order our roller shade sample brochure (no charge for this brochure). We stencil on all these materials except the vary dark forest green classic cotton. Above, a rare vintage Arts & Crafts interior with roller shades and no curtains.